CALGARY, ALBERTA--(Marketwired - April 25, 2017) - Canacol Energy Ltd. ("Canacol" or the "Corporation") (TSX:CNE)(OTCQX:CNNEF)(BVC:CNEC) is pleased to announce that it has purchased Pacific Exploration and Production's ("PEP") 50% operated interest in the SSJN7 Exploration and Production ("E&P") Contract for a consideration of the assumption of contractual exploration obligations to the Agencia Nacional de Hidrocarburos ("ANH"), Colombia's resource administrator. The agreement is subject to approval by the ANH, which the Corporation expects to receive within the next 3 to 6 months. Charle Gamba, President and CEO of Canacol, commented, "The low cost acquisition of the SSJN7 block continues the consolidation of our core operated gas exploration and production area in the Lower Magdalena Valley basin, following the purchase of Shona's interests in the Esperanza and VIM21 blocks in 2012, and of OGX's interests in the VIM5 and VIM19 blocks in 2014. Our consolidation efforts over the past four years have been both low cost and successful, with our exploration efforts on those blocks yielding six commercial gas discoveries containing 318 billion cubic feet of 3P reserves as represented by the Corporation's reserve auditors since 2014. The SSJN7 block occupies a prime central position within our core gas exploration area, with the block flanked both to the north and to the south by large producing gas fields and historic commercial gas fields discovered on the block itself. 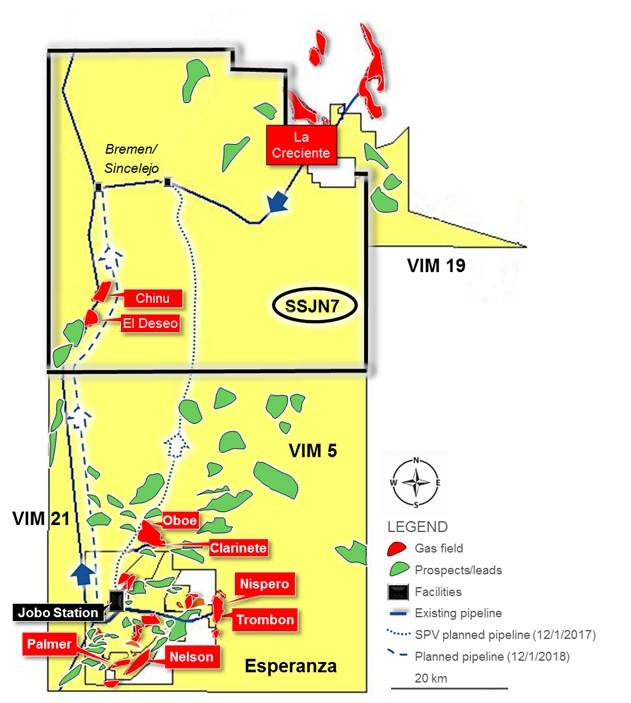 SSJN7 is located along both the Cienaga de Oro (CDO) and the Porquero exploration gas play fairways that our management team knows well, having drilled six commercial gas discoveries in the past four years into these fairways on the adjacent operated blocks. The block is also situated along the route of both the existing Promigas pipeline and the planned route for the new gas pipeline that Canacol is building via a Special Purpose Vehicle. This ensures that when gas is found on the SSJN7 block it will be quickly and efficiently commercialized." The SSJN7 Contract is situated between the VIM 5 and VIM19 E&P contracts where Canacol has a 100% operated working interest acquired from OGX in 2014 (Figure 1). The SSJN7 block is 669,000 gross acres in size, and increases Canacol's net exploration acreage position 43% from 785,000 acres to 1,120,000 acres within the most prolific gas prone and productive part of the Lower Magdalena Valley basin. The SSJN7 block is situated along both of the proven and productive CDO and Porquero gas play fairways, as evidenced by the position of large producing gas fields both to the north and to the south of the block. Historically, a number of exploration wells have been drilled, and two commercial discoveries in the CDO were developed on the block, namely the Chinu (1956) and El Deseo (1989) fields. At present, Canacol management have identified a number of leads based on the limited 2D seismic coverage on the block. As part of the future plans for the block the Corporation will reprocess the existing 2D seismic data utilizing seismic processing and interpretation techniques to identify gas-filled reservoirs. The Corporation expects to high-grade prospective areas on the block for the acquisition of additional 2D and 3D seismic data to advance the leads to prospect status, and to identify additional leads and prospects. The Corporation expects to acquire new seismic and drill an exploration well in the next 18 months. Canacol is an exploration and production company with operations in Colombia, Ecuador and Mexico. The Corporation's common stock trades on the Toronto Stock Exchange, the OTCQX in the United States of America, and the Colombia Stock Exchange under ticker symbol CNE, CNNEF, and CNE.C, respectively. This press release contains certain forward-looking statements within the meaning of applicable securities law. Forward-looking statements are frequently characterized by words such as "plan", "expect", "project", "intend", "believe", "anticipate", "estimate" and other similar words, or statements that certain events or conditions "may" or "will" occur, including without limitation statements relating to estimated production rates from the Corporation's properties and intended work programs, gas pipelines, and associated timelines. Forward-looking statements are based on the opinions and estimates of management at the date the statements are made and are subject to a variety of risks and uncertainties and other factors that could cause actual events or results to differ materially from those projected in the forward-looking statements. The Corporation cannot assure that actual results will be consistent with these forward-looking statements. They are made as of the date hereof and are subject to change and the Corporation assumes no obligation to revise or update them to reflect new circumstances, except as required by law. Prospective investors should not place undue reliance on forward looking statements. These factors include the inherent risks involved in the exploration for and development of crude oil and natural gas properties, the uncertainties involved in interpreting drilling results and other geological and geophysical data, fluctuating energy prices, the possibility of cost overruns or unanticipated costs or delays and other uncertainties associated with the oil and gas industry. Other risk factors could include risks associated with negotiating with foreign governments as well as country risk associated with conducting international activities, and other factors, many of which are beyond the control of the Corporation. Resource definitions, including those set out below, are as specified by NI 51-101, including by reference to CSA Staff Notice 51-324 - Glossary to NI 51-101 Standards of Disclosure for Oil and Gas Activities and the COGE Handbook.